In a condo complex, can tenants’ assigned parking spaces be converted to disabled parking spots? Can the landlord remove an accessible parking space when a disabled tenant moves out? Can employees be assigned accessible parking, or is it first-come, first-served? Can a friend or family member park in an accessible spot, if they are picking up someone with a valid disabled parking placard in the car? Q. Where can I park with an accessible parking permit? Some state and local laws give you additional street parking privileges, such as exemptions from parking meters. For more information on accessibility rules, click here. Q. How close should accessible parking be to the entrance? Accessible parking must be on the shortest accessible route to an accessible entrance, but there is no required distance. Q. What size of stop sign do I need? For schools, hospitals, apartment complexes, office parking lots, etc, a 24" stop sign is sufficient. The speeds here are very low (e.g. you are driving into a curb, a short access road, etc.). And, in practice, these signs are usually mounted at 5’ clearance heights (i.e. an 8’ post is used). For roads with higher speeds, a 30" stop sign is best. Q. I am confused. When should a sign be yellow green fluorescent? Versus just yellow fluorescent? Yellow-green is used for school signs and is reserved for pedestrian traffic warnings. The yellow or yellow fluorescent is used for traffic warning signs. Fluorescent yellow-green signs are often called SYG signs ("strong yellow green" signs). Q. Aren’t the rules for reflective signs about to change [again] in 2009? • High Intensity or Diamond Grade sheeting will be required for all traffic signs. • Engineer grade signs, however, are likely to be acceptable for parking signs. • The official rules will take another two years in gestation. And, once they go into effect, traffic sign users will have from seven to ten years to phase in new signs. • The impact will be that most sign buyers will start to switch all orders for traffic signs to these brighter materials. Given the liability and lifecycle economics, this is probably the rational outcome. Understand, of course, that rules change and that politics [can you imagine this!!] may interfere with the trends that look to be in place now. So, please check the rules as the develop! Q. What liability do I have [mall operator] have if my sign is no longer terribly reflective? As we mention before ... if your parking lot and roads are "open to public travel", your signs should follow MUTCD standards. They need to meet the same levels of retroreflectivity that are required for traffic signs on public highways and roads. The tort liability issues, of course, require a lawyer – especially for off-street roads and lots. Off-street means roads that are built or maintained privately. In our experience, however, there is a very strong case for installing the best, brightest and most durable signs possible. When you look at the possible liability when compared to the life-cycle installed cost for even the most costly signs, it is easy to see why so many thoughtful property managers insist on high intensity or diamond grade signs. Wouldn’t the plaintiff’s tort lawyer (after an accident) love to find out that the property owner scrimped on their signs and that the local government has upgraded to a higher quality? Q. What is the "Safe Routes to School" program and does this have any bearing on our school signs? Our understanding is that the goal of this program is to encourage walking and biking to school – and therein build a healthy habit of physical activity. Make is safe to walk to school and keep our children fit. Part of the program, of course, is to make it easier to bike or walk to school. This may mean wider sidewalks, better pavement marking, lighting and, yes, better signs. In some cases, you may find that there is funding that your school or community may obtain to help pay for these updates. Many of our signs are also Safe Routes to School compliant. For more information, click here. Q. Is it legal to put an auto boot on a car that is parked illegally on our property? We turned this question over to our lawyer. He said that there may be some local rules, but, in general, this is an accepted practice that, if done prudently is a legitimate way to protect your property. We recommend that you use a sign that clearly states that booting is practiced and that violators are likely to incur this penalty. Also, the sign should provide a number or way to contact your office. Be tough, but clear. And, just in case, you might want to check with local regulations. Q. When I look at your site, I see that the supplemental ADA sign that you recommend shows that the fine is $100. Yet, I know that our community has fines that are larger. What is wrong? We show the state rules. Understand that, in some communities, the local law may mandate a slightly greater fine. If so, please use one of the custom templates and add the correct fine amount. In our experience, however, only a very small portion of the [roughly] 3,000 counties or parishes across the US have special rules that overrule the state guidelines. Please check, to make sure. Q. We have experienced a rash of accidents at one of our intersections. I am afraid that the stop sign is being ignored. Do you have any suggestions? Let’s have you try one of our diamond grade reflectors. These super bright blank signs should draw extra attention to the stop sign. Q. What is the appropriate speed limit for our signs for our office parking lot. It is near a hang-out for kids, too? If an accident occurred, what are the chances of survival? Generally parking lots post 15-25 MPH signs. But, much depends on visibility, whether kids are around, weather conditions, etc. A Helsinki study taken in 1993 on vehicle-pedestrian crashes showed that the risk of death for a pedestrian increased rapidly from collisions at very low speeds (around 15 mph) to higher speeds (about 50 mph), where death was almost certain (Pasanen and Salmivaara 1993, 308). A European review of several studies of vehicle-pedestrian crashes confirmed these results. It concluded that 5 percent of pedestrians are likely to die if they are struck by a vehicle traveling at 20 mph and that risk levels rise sharply with speed—to a 45 percent probability of fatality for the pedestrian at 30 mph and an 85 percent probability of fatality at 40 mph (ETSC 1995, 11). The moral of the story here is, the slower the speed the safer your parking lot is. Q. What is the right size for a No Parking sign? Most No Parking signs are 12” across by 18” in height and they are mounted at a height of 6’ (using a typical 8’ post that is sunk 1.5-2’ into the ground). Yet, we see a shift towards larger 18” x 24” parking signs and 10’ posts. This is in part due to larger and taller cars. A bigger sign can be seen from a greater distance and around those large Hummers and other gas guzzling trucks. Now, there are no specific height requirements for a simple No Parking sign, however, there are certain regulations for No Parking Tow Away signs. Most states have their own specifications for how large the sign must be and how high off of the ground it should be posted. Some, like California, require a Tow Away sign to be no less than 17” x 22”, while others, such as Texas legally recognizes only those signs that are at least 18” x 24” in size. Some states however, do not have such requirements, but rather than being discreet with a smaller sign in a not-so-visible location make sure you cover all your bases with a larger sign that gets noticed. 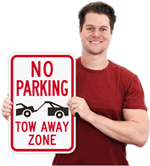 After all, the whole point of a No Parking Tow Away sign is not for it to get lost in a sea of oversized vehicles and go unnoticed, but rather to prevent drivers from parking in designated spots. A larger, threatening sign is sure to scare potential violators away from reserved parking spaces. A good rule of thumb here is that more is better. Go big! There are no downsides, save for the small cost of the 216 square inches of additional visibility for an 18” x 24” sign. A sign that meets all of the size regulations is a worthy (and low cost!) investment. To prevent any confusion or possibly a minor law suit, make sure that your No Parking Tow Away sign is conspicuous enough to get noticed, even when a Hummer is parked right in front of it. Q. What is a no-standing zone? No standing usually means you can drop people off or pick them up, but you can't load or unload things from cars or trucks. These signs really mean "not a loading zone." In most cities, a No Standing sign means you can stop and wait, as long as the driver stays behind the wheel (and in some places, the car must keep running). Q. What is a no-parking zone? In most cities, no parking means you can stop the car, and you can load or unload people and goods, but you can't leave the car alone. (Check out an example of these laws in Illinois.) As ever, if police tell you to move along, you're responsible for complying with their request, no matter what signs tell you to do - police overrule traffic signs. No parking signs rely on the distinction between parking and stopping. In California and most other states and cities, parking means leaving your car, while standing means moving goods around, and stopping just means not moving your car. Q. How long do the stop signs really last? Much depends on your climate and if the sign faces north (the best) or south (the worst). Although 3M no longer offers a warranty on their engineer grade signs, they are generally seen to have a service life of 7-10 years. High Intensity and Diamond Grade stop signs last much longer. It is not uncommon to find signs made of these materials with good retroreflectivity and contrast – even after 12 years. even though the initial costs of Type III [Diamond Grade] materials are slightly higher than Type I materials [Engineer Grade], the longer material life can produce more economical lifecycle costs. The longer material life also results in sign technicians spending less time working within the right-of-way to replace deficient signs, thus reducing their exposure to being struck by out-of control vehicles. Q. Who would ever spend 2-3x more for a diamond grade stop sign? Yes, these diamond grade stop signs are much more costly. But, they are increasingly popular. Use them for high traffic areas, areas with plenty of other visual distractions, or, when you want superb durability. Many sign companies [and even film manufactures] have been heard to complain that diamond grade signs last too long. With a warranty of 12 years, we have seen most stop signs last longer. Some states even have their DG3 signs on a 17 year replacement cycle – even though the warranty is only for 12 years. If you do the math, it is easy to see why a more expensive sign, once you consider the lifecycle costs and greater safety becomes, in fact, the most economical choice. Q. How are the differences in High Intensity Film? And what do the terms, "HIP", "HIB" and "HIS" mean? The method that 3M uses to manufacture the most common high intensity films has changed. High intensity films, originally used beads. Yet, the shift has been to prismatic constructions. The new term, "HIP" means "high intensity prismatic". The HIP signs are brighter, generally, than the old HIS (or beaded) signs. HIP signs actually have gray bars on the inside of the film that help deaden the retroreflectivity a bit. When these fade in time, some find that the HIP signs actually become more reflective and brighter. Q. What is the "Matched Component System" from 3M and why is this important? We believe that this system approach matters. The inks and the film and meant to work together. They are tested to work together and to give you the best warranty possible. As tempting as it may be to use another company’s ink, there is always the danger of "finger pointing" in case of failure. Given the cost of the ink (especially when compared to the life cycle cost of a sign), it only makes sense to use the best available. Q. What grade of aluminum is used to make road sign blanks? We offer aluminum sign blanks in two alloys, 5052-H38 and 3105-H191. We carry multiple guages (thickness) including .040, .063, .080, .100, and .125. All aluminum is processed in-house to better control quality. We level, treat, cut, punch and radius aluminum coils into road sign aluminum blanks, all within our 65,000 square foot production facility. Q. What is the best thickness for a parking sign? Although there have been plenty of innovations in the industry over the last 35 years, changing aluminum thicknesses has not been one of them. We have been making parking signs since the 1930’s and see no good reason to change what has been a time proven parking sign thickness. We have over 100,000 active parking sign customers and sell thousands of parking signs per week. We have yet to hear of a complaint that a parking sign has bent in the wind or by a vandal. Several smaller sign companies do not want to bother stocking two thicknesses, hence all signs are sold in the heavier gauge. Thicker signs become too heavy to install, needlessly add to shipping costs and require greater attachment hardware. On the other hand, we try to make sure that our customers are delighted with our signs. So… if you want a thicker parking sign, please contact our CSR team and we will gladly use a thicker sign material for your parking sign order. Q. What size of Parking Sign do I need? Most parking sign bought (and specified by local and federal standards) are 18” tall by 12” wide. That’s the most common size. But, many parking lot owners want to emphasize a rule or need to mount a sign a bit further back from the actual reserved parking spot. In one common example, a sign must be mounted on the behind the sidewalk the fronts the parking spot (e.g. there is a sidewalk between the sign and the beginning of the parking spot). In this case a larger sign, such as a sign that is 24” tall by 18” wide, is needed to achieve the same visibility that a sign mounted right at the beginning of the spot. Q. What grade of reflectivity should I use for my sign? Q. What is POF laminate? Q. How do I install a post? We want our sign to be about 6’ above the ground? Here’s the easiest solution. 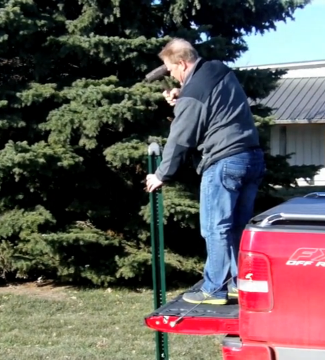 Buy an 8’ post, a drive cap and, if possible, get access to a pickup truck. Back the truck up to the spot and use a sledge hammer while standing on the back of the truck. See our video for more insider’s tips on post installation. Avoid using a ladder. Swinging a sledge hammer while dangling on a ladder is both foolhardy and dangerous. Q. What is the difference between a 1.12# and a 2# post? Most cities use a standard 2# post. These are used for Stop Signs and larger Speed Limit signs. 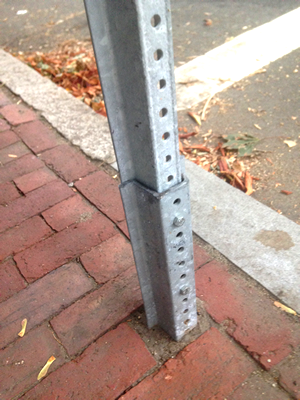 To save cost, most savvy parking lot owners, however, use 1.12# posts for their parking signs. These medium weight posts are good for 12 x 18” signs. Round posts are generally used for street signs. Special hardware if you want to attach parking signs to a round post. Q. How do Rail Steel and Rib-Back posts differ? You must be an insider! Yes, there is a very important distinction here. We supply Rail Steel posts in that these are the most widely sold and specified posts in the US. They are NCHRP 350 compliant, and approved for use in every city and county nationwide. They offer convenient, pre-drilled holes which makes it easy to position sign properly. In contrast, many of the online sign companies offer Rib-Back posts. Rib-Back posts are not nearly as common as Rail Steel posts in the field. 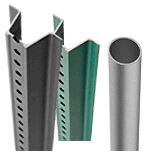 Our Rail Steel posts offer many advantages over Rib-Back posts, including ease of handling and greater compatibilty. Most in-ground stubs in the US use Rail Steel. To preserve crash / break-sway integrity, do not mix post types. Q. How deep does the sign post have to be [into the ground]? It is recommended that you bury the post two to three feet into the ground. Yet, when you go to the field, most sign posts are actually only buried 18" into the ground. While this is probably okay for most off-street signs (e.g. a Wendy's parking lot), please bury larger signs deeper. 30" stop signs, for example, need to be buried three feet. "The bigger the sign, the deeper the hole". Q. I want to install a stop sign near to a busy sidewalk. How high should the sign be and do you have any instructions for our grounds crew? The bottom of the sign should be about 7' from the ground. When you install the sign, let me just borrow "Bryan's" rules. 1. Buy two posts and a standard kit that includes two bolts and nuts. Many just buy two 6' posts. 2 Find the spot that is visible, but not too close to the road. A distance of about 6' from the road is ideal. Find sledge hammer and borrow a strong back for about five minutes. Pound one of the two posts into the ground. Don't bother with digging a hole. Just pound away. Although many recommend that you sink the post 2-3 feet into the ground, most installers seem to stop short of this. 3. Fasten your sign to the second post. The flat part of the sign needs to rest against the flange of the post. This gives you the greatest stability. 4. Take the other post and lay it on the ground near to buried post. Thread a bolt and washer through the fifth hole from the top of the buried post. Thread from the inside of the post (inside the "C"). Then, thread the bolt through the second post. Align the posts so that they will nest. Swing the second post to vertical and tighten the nut at the back. 5. Choose the next hole that is about 4" higher (leaving three open holes). Thread and tighten the second bolt and nut. This can be done by one person. For more information on break-away posts, see our sign tips. Q. Do tapered posts work better? Is it faster to pound these into the ground? Tapered posts seem like a good idea, but in practice tapered posts do not make much of a difference. Frankly, I wish they did work better. To anyone who has spent the last 30 minutes pounding a post into the ground can attest, any savings would be worth it. But, in our experience, a tapered end of a post makes no difference. Our 2# standard posts actually have tapered ends. Our 1.12# medium weight posts do not have a tapered end. 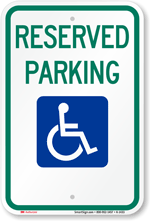 Q. I am putting new reserved parking signs around our lot. What posts do I need? Most parking signs are fastened to 8' posts. Generally, they are sunk about 1.5 feet into the ground. Q. Can I just buy posts from Home Depot? Or, the local farm supply store? The kinds of posts that you typically see at a local store are called "T-Posts". These are used to hold wire and have barbs along one side. Unfortunately, they are not suitable for signs. In our experience, U-Channel sign posts are not readily available from retail stores. Q. Do you sell taller posts? A 10' post? We offer 10 foot posts, although we certainly could ship these to you. The trouble is with shipping. UPS handles posts that are 8' or shorter. Longer posts must be shipped via a trucker. In most cases, the minimum trucking fee is $75.00. We have had too many customers (understandably) upset with a shipping bill that is $125 for a post that, itself, only cost $35 each. In many cases, it is easier to buy two smaller posts and bolt them together. There is further benefit too – you do not have to climb such a high ladder to drive the post into the ground. A heavy sledge hammer is tough enough to wield with two feet on the ground, let alone when you are precariously perched onto a ladder. Q. When are 360° breakaway posts used? These types of posts are found often for signs mounted in medians. The post can be hit from any direction. We offer a similar item in our Flex Posts. These offer 360° flexibility, preventing damage to vehicles and to your parking lot. Q. What is the most common post used for a 24" stop sign? Although we seen a plenty (and, maybe even a majority) of off street parking lots use an 8' posts, we recommend that you use two 8' posts. Follow the MUTCD rules and get the sign up a clearance height of 7'. Q. How do I use a Post Driver? The Post Driver is surprisingly easy to use, even for a first-timer. For narrower (2.5" diameter) posts, our post drivers are tough enough to let you give a "dead blow" -- just hold the handle firmly and take advantage of a 30% more efficient drive. The driver is comprised of a cam and a lifting hammer that drops onto an anvil. The impact on the anvil is transferred to the post through a thick center tube head to get your post in the ground. Just hold on tight for a sturdy, ergonomic post drive with less hassle, in less time. Q. How should a U-channel post be installed? 1. Call 811 before you dig. 2. Dig a post hole. The hole should be three times the post diameter, and a third of the above-ground post height, plus six inches. So, to install a post 2" in diameter, and with 9 feet showing above the ground, the hole should be 6" wide and 3' 6" deep. 3. Put 6" of gravel into the hole and set the post on top of the gravel. Check for plumb. The gravel is to protect the bottom of the post from rust and allows the water to drain. 5. Mix and pour the concrete. To avoid having exposed concrete, pour concrete to 3/4" below ground level. 6. Use a level and check the post for plumb. Secure the braces as appropriate. 7. Allow the concrete to dry overnight.